As we arrive at the end of 2013 and the beginning of 2014, we have a wonderful opportunity to ponder on what has happened in the past year and how we would like things to change in the next. Such reflection has deep roots in our ancient past and it is both fun and profound to use some of these old ceremonies and rites to aid both our celebrations and our contemplation. First, to New Year’s Eve, where “Hogmanay” refers to a Druidic rite in which the ancient priests of Britain cut down the sacred plant of mistletoe, passing it out among the people as a powerful symbol of peace. 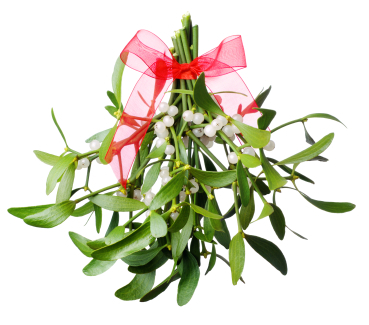 Such was the power of this female symbol, that ancient warring Celtic clans would drop their weapons and declare peace if mistletoe was seen in the forests where they were fighting. 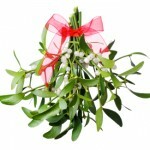 Today, this is represented by kissing under the mistletoe. If you are lucky enough to be able to find a Mummers’ play on New Year’s Eve, then go and watch the powerful reminder of the battle between good and evil in which good always wins to much booing and cheering. If you can’t find one, then get together with some of your friends and enact the story for yourselves. It is great fun! There are also traditions of house cleaning and tidying on New Year’s Eve when the air was cleansed using a juniper and water rite. This can be done easily today with incense, purifying all the musty and neglected corners of the house. In “First Footing”, new light is brought symbolically into the coming year. One modern version is to extinguish all electric lights just before midnight on New Year’s Eve and light one, single candle. Someone takes the lit candle outside, charged with guarding the flame from the ravages of any inclement weather. At the midnight on the stroke of twelve, there is a knock on the front door and the light is brought back in. The flame is then used to light candles in each room as a symbol of living light for the New Year. A variation of this is the welcoming in of a friend who brings a lump of coal to ensure the coming of plenty throughout the next twelve months. In parts of Scandinavia, the god Yule is welcomed into the house by setting a chair piled with gifts and food by the front door for him to receive. Whichever custom is enacted, there is always a fortifying drink to share – often an egg-nog or egg-flip – to warm the cockles of the heart and bring good cheer to all present. And so we arrive at New Year’s Day, otherwise known as the Kalends of January. In ancient Rome, this was a day of hope and a celebration of life, often riotous and always full of festive fun. In Britain, the ancient way was to Dress the Well first thing on New Year’s Day, referring back to the ancient belief that wells were female gateways to the Otherworld and the dwelling places of powerful spirits. In coastal dwellings, the first seaweed or driftwood was collected on New Year’s Day and put on the fire at home to thank the newly risen sun. Divination was also traditionally practised on this day in an attempt to predict the coming year’s weather. As the daylight fades on New Year’s Day, try looking for a bull-shaped cloud in the sky. If it lies to the North, is densely black or has a soft, frosty appearance, it promises to be a year of plenty. If it lies to the East, the year will be good enough. If it lies to the South, there will be enough straw but little grain. If it is in the West, however, the year will be dull and unproductive. There are lots of colourful ways to mark the end of one year and the beginning of the next and, in the twenty-first century many of these ancient rites are having something of a revival. You can always join this rebirth. If there is nothing being celebrated near you, then it is easy enough to make up a home-made, modern version. All you need is some good friends, a fortifying drink or two to share, and a desire to have fun! So, let the celebration commence. Have a happy, prosperous and peaceful New Year and may 2014 be full of joy, laughter and friendship.